I was having this discussion a while back with friends over lunch and casually I said that “if someone gave me my five years back I would do things differently”. I was very serious about it. Over the past few months I have been a little off trackish. I have come to realise that I did a lot of mistakes only because I wanted to avoid doing mistakes. I never bet on my qualities rather I tried too hard to do things that I inside knew I wasn’t good at. But then of course with age comes understanding and with understanding comes regrets. I was thirteen when mum died and thereafter ensued a battle against my existence. I never had a moment of peace after that. A sister who needed me and a life which left little space for my own demands. I don’t remember a single time when I could have said that yes I am a teenager. I crib and cry I complain I demand. Even today funnily when I read teenage issues stories around such themes I feel slightly disoriented. I can’t seem to remember such a time. Time passed and of course academics suffered. Not to the extent of going down the drains. But yes from top three to top ten. And in turn confidence took a big downslide. I stopped believing I could do it. I stopped telling myself I was capable of something. The word average got attached. And then nothing changed- average student did averagely well in competitive exams joined a good enough company and now earns an average salary. I was passionate about writing. But taking that path would have meant to go slow on life. To not become financially independent. To allow others to take charge of your life and so I always ran behind easier ways to prove myself- engineering was the sure shot way to get a job in this country. But now at 26 and married I realise I only scaled the medium. I only allowed myself to go to places others had left footprints all over. And now I am sick of it, tired of being the same average human being. What is so special about me? When mum said I was destined for stars why did I leave that thought in between? And perhaps I won’t get the whole five years back. 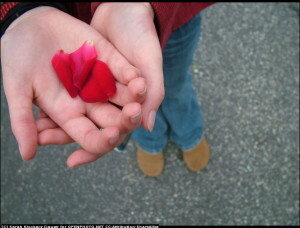 Perhaps the rose that is broken will not join back but I know I have the petals intact. I know I have myself inside me. Those five years like the broken rose will never return. But what will never go its the pieces of it. I know engineering was a safer option but then today that degree gives me confidence to experiment. It removes all thoughts of “where bread and butter?” But yes I agree if today I could go back I would not do this. I would have bet on my writing and done something in that direction…. Though written as part of Write Tribe but honestly its something I have been wanting to write for long. The broken petals cue somewhere gave me the strength to rant…..
Well.. I feel I have crossed the phase when I can ever say if I could go back and change it would have been … better should I say ? I have been an utter failure if you go by the same rules Indian kids are considered to be successful .. Listening to what you heart says requires you to be financially independent.. as in parents who would not question you for following whatever you like .. Even the richest parents question !! Being Sachin Tendulkar in whatever you do requires luck . At 7 not every child is expected to know exactly what he is supposed to do !! then came a realization ..given those circumstances .. at that point could I take any better decisions .. the answer was NO !! Got my confidence back .. took three months to come over my suicidal mood without rehabs …and gave myself room to realize .. we think we control our lives .. had that been a fact we would have been asked to select our parents .. the city we would love to be in and moreover the life partner we wish to be with !! Are love marriages our true choices ?? do we get to see the entire world before we commit this is the best guy for me or girl ??? Someone better may not have been given a hearing too, who knows !! Sorry for going over board but I felt i should keep my point here !! I am sure if we all were sent back five years we would want to do things differently. But then what we chose then is what made us now. Since this is ‘our’ choice and it worked I guess there’s no repent. Nice to get to know you better here. I look at life as a teacher of great lessons. Your honesty comes through from this piece of writing. Learn from yesterday and look forward to building a better tomorrow, starting today. For that and only that is what we have in our hands. God bless. Very Nice Post Richa. .
All I could is it’s very touching piece since I find myself speechless. This is very touching, Richa. I guess each gets different cards dealt out in life – and then it is upto each person to make the most of whatever cards he/she has got. I think you got a very cruel hand dealt to you early on – but what’s important is that you’ve managed to come out of it. Hope good things happen to you from now on in your life.